When we sat down for a chat at the new Stone Hill Center last month, Michael Conforti, director of the Sterling and Francine Clark Art Institute, Williamstown, MA, must have thought he was talking with Rosenbaum, not CultureGrrl. He asserts that he never reads blogs (although he’s been known to read posts forwarded to him by others). 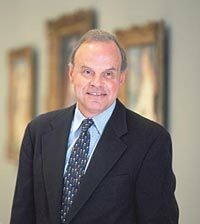 As the new president of the Association of Art Museum Directors, with a two-year term for a post that formerly lasted one year, Conforti is in a position to implement many of his well-honed principles of museum governance. I was particularly interested to see if he agreed with the premise behind my recent cultural-property posts (here and here), in which I made specific suggestions about what the next steps towards a ceasefire in the antiquities wars ought to be. CultureGrrl: It seems to me that the next step in the antiquities guidelines should be: “What do you do with the stuff you’ve already got?” Are you going to develop guidelines about what museums should do about claims? Conforti: This [the most recent antiquities guidelines issued by AAMD] is focused on prospective acquisitions. My goal at AAMD is to get people to start talking about other things that we can do with one another. What the Italians were very anxious about has now been returned. They feel quite good about that. The point is: What is the Italian public interested in? It’s not antiquities; it’s Impressionism! We send more objects to Italy on loan than Italy sends to us. Once you start to talk about things like that openly, in an environment of trust, you’re going to have a different conversation. I can’t say there will be no more requests for things, but that’s certainly not the future of conversation between Italy and the United States. It has to be about other things. I think that’s true of many countries. Italy may be a little more willing at this point, because of the particular nature of return. But I think we’re going to see that the Americans are now in harmony with much of the rest of the world and we can start engaging with the rest of the world without focusing on what we’ve done in the past vs. what we might do in the future. CultureGrrl: Does AAMD have no intention to draw up guidelines about what to do with works already in American museums’ collections? Conforti: We have our guidelines: The guidelines are about [future] acquisitions. We do allow for gifts or even purchases of objects with an unclear provenances after 1970. I think we are doing this responsibly and it won’t happen very often, because we are putting them on our website [none are listed yet] and we’re very open about that. So there will be a return policy then, if something occurs. If there are claims for objects with unclear post-1970 provenances, I know that American institutions will respond responsibly, but I’m not sure that’s where the future will be. We’re talking 30-35 years here, and how much was actually collected and what else do we have to deal with? Is it all about moving those things around, back and forth? Our world cannot be about dismembering institutions that were established in the past. They’re part of our intellectual history. Traditions of associating objects with power were long established, from ancient Roman times to the Renaissance and the rest. We’ve moved away from that now but to what degree do we go back and change it? CultureGrrl: What do you want to do with AAMD in the next two years? We have an intention to be as open and as communicative with media as we can and that may not have always been as consistent in the past. These are the messages we’re anxious to communicate, so that not only the American public but, particularly, Washington knows what great value art museums are to culture. I think we sometimes, in the noise around other things, have missed that. CultureGrrl: Do you have any interest in the position that I nominated you for? Conforti: I have no intention of being anywhere but here at the Clark….This [who should succeed Philippe at the Met] is something that museum directors never talk about. Not only don’t we talk about it because it’s not polite. It’s just that there are so many other things to talk about. The last people to ask are the museum directors.